I am so happy to share that this post is sponsored by Big G Cereals. 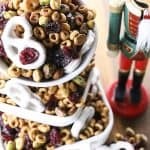 All opinions about this delicious whole grain, honey and vanilla yogurt snack mix designed to boost your energy, with tasty, festive morsels of Nutcracker inspired red cranberries, green pepitas or pistachios, and white vanilla yogurt pretzels remain, as always, my own. This is the most wonderful, snack-tastic time of the year. It seems everyone has little bowls of candy or snack mix on their desks or tables. Grabbing a little handful of this or that to nibble on while you work, chat, or otherwise spend time together is just part of the season. This time of year is also Nutcracker season in our ballet family. For the second year in a row, our youngest is dancing in Neglia Ballet Artists‘ The Nutcracker with The Buffalo Philharmonic Orchestra. This is a professional production, not a hobby production, so this means that we are in Buffalo between 4 days and 6 days a week leading up to The Nutcracker which translates to 3 hours in the car for each rehearsal or between 12 and 21 hours in the car per week. In other words, we are on the road a lot and at the studio and theatre for hours on end. Given that my little dude is dancing his little rear off, we need to make sure that the food we feed him to refuel is not junk. Enter Cranberry Pistachio Snack Mix, stage right. Cranberry Pistachio Snack Mix is all sorts of perfect for us. 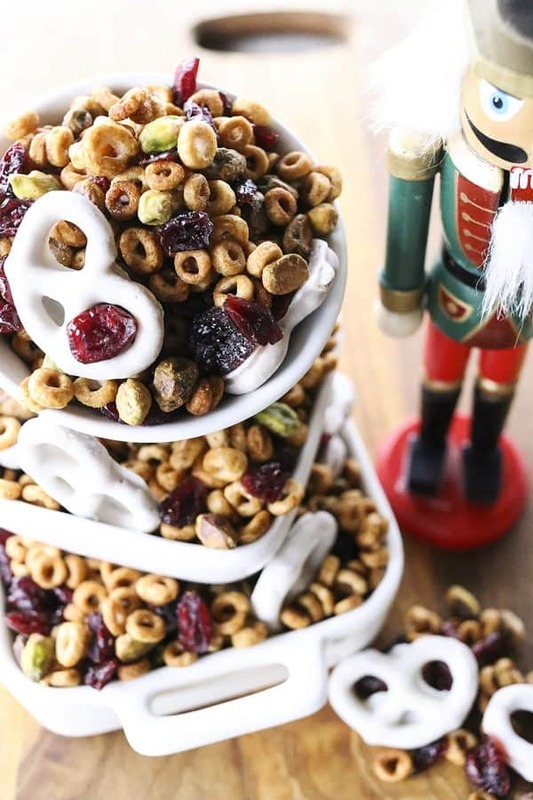 This simple-to-make-and-take snack mix starts with a hearty helping of whole grain Honey Nut Cheerios; we sub Original Cheerios when making it to share with our ballet buddies because Neglia Ballet Artists maintains a nut-free studio. We toss the Cheerios in a mixture of honey and vanilla Greek yogurt, add in either pistachios or pepitas (depending on the audience), and pop the works into the oven to toast the honey and yogurt mixture onto the cereal and seeds or nuts. 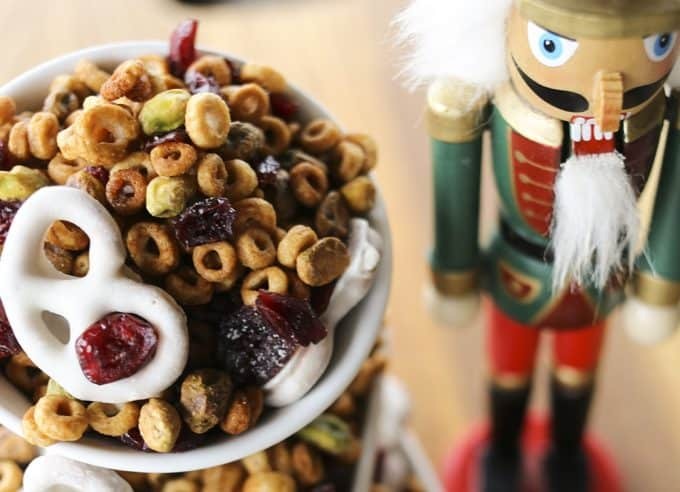 Once the coating has dried up around the cereal, we toss in dried cranberries and vanilla yogurt covered pretzels. Again, we can customize this to suit our audience. Since gluten-free vanilla yogurt pretzels are pretty easy to come by at Walmart and Target, we often go this route so when sharing with our gluten-free friends. Handily, seven varieties of Cheerios are gluten-free, so we don’t have to sweat that at all! They include original Cheerios, Honey Nut, Frosted, Fruity, Chocolate, Apple Cinnamon and Multi Grain. Cranberry Pistachio Snack Mix is so woven into this part of the year for us for so many reasons. To begin with, all those hours we spend in Buffalo are accompanied by the tempting aroma of toasting Cheerios. That’s not due to me walking around with a slow-cooker full of warm Cheerios, although I might be convinced that is a good idea. It’s because Cheerios are made in Buffalo. If you are in the right part of the city (and we often are), you’ll catch that scent on the breeze. And if you’re anything like us, you’re going to want to reach for some toasted oat Cheerios immediately. 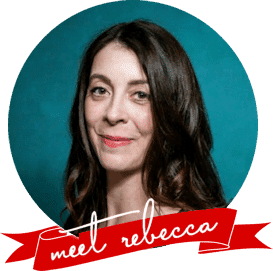 I am always happy to oblige because I know Cheerios are made with whole grain oats and without any of the things I try to avoid for my kids; Cheerios contain real ingredients and are blessedly free of colours and flavours from artificial sources. Honey Nut Cheerios are made with real honey! Here’s where it gets even better, though. Neglia Ballet Artists’ and Neglia School of Ballet maintain nut-free environments to help safeguard the health of some of their young dancers who have dangerous nut allergies. While we have the Cranberry Pistachio Snack Mix in our car for ourselves, we can bring a version of it that is fully nut-free and gluten-free to share with our friends at the studio; it is as easy as subbing in Original Cheerios for the Honey Nut Cheerios, and pepitas for the pistachios. Any which way we make it, whether with Honey Nut Cheerios or Original Cheerios and with pepitas or pistachios, we end up with a honey vanilla yogurt whole grain snack mix designed to boost your energy, that comes festooned with tasty bits of Christmas-y Nutcracker-ready red cranberries, green pepitas or pistachios, and white vanilla yogurt pretzels. I feel better about giving my kids honey sweetened snacks rather than sugar sweetened ones and this snack mix follows the strict food guidelines Neglia Conservatory has in place when I make it with the pepitas. The fact that I can make it so that ALL of my kids’ friends can eat it, even those with food allergies, makes it even better for this season of good will and fellowship. My son cracked that the pistachio version was the “Marie/Clara Nutcracker Snack Mix” and the pepita one was the “Fritz Nutcracker Snack Mix” because “Fritz broke the Nutcracker, so the Nutcracker wouldn’t shell the nuts for Fritz’s snack mix.” And friends? If you get that Nutcracker reference, you’re probably doing the same ballet commute I am, and could use a bowl full of Cranberry Pistachio Snack Mix. I will share. For a nut free version, use Original Cheerios and pepitas (pumpkin seeds) in place of the Honey Nut Cheerios and Pistachios. If you’d like to share with gluten-free friends, we often substitute gluten free yogurt covered pretzels for the regular ones. They are easy to source in Target and Walmart. I recommend using a mild honey such as clover or orange blossom rather than a dark bamboo or buckwheat honey. If your mix becomes slightly stale after a few days and you still have some left, remove the yogurt covered pretzels from the mix, spread the mix on a cookie sheet and place in a preheated 250°F oven for 10 minutes, or until crisp again. Cool completely before stirring the yogurt covered pretzels back into the mix. Preheat oven to 250°F. Lightly spritz a half sheet pan with non-stick cooking spray. In a microwave safe bowl, combine the oil, honey, vanilla Greek yogurt, pure vanilla extract, and kosher salt. Microwave for 45 seconds, or just until you can whisk until smooth and evenly coloured. If you are making the nutty version, add the Honey Nut Cheerios to a large mixing bowl. If making a nut-free version, add the Original Cheerios and the pepitas to a large mixing bowl. Pour the liquids over the cereal and toss gently to evenly coat the cereal. Spread the mixture evenly in a single layer on the prepared half sheet pan. Bake for 1 hour and 15 minutes, stirring well every 15 minutes, or until the Cheerios are golden brown, dry to the touch, and crunchy. Remove the pan from the oven. Let the mixture cool for 5 minutes before transferring to a mixing bowl or storage container and gently stirring in the pistachios (if making the nutty version), yogurt covered pretzels, and dried cranberries. Let cool completely before covering. 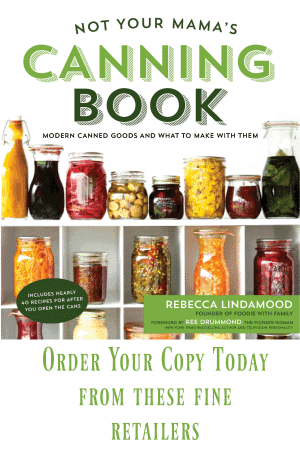 Store in an airtight container at room temperature for up to two weeks. Cranberries and pistachios were MADE for each other! My husband is a Cherrio addict – we always have 3 flavors on hand – so this is happening! Oh, hooray!!! I think he’ll love them!! All the deliciousness in one mix! Love it! Thanks, Kelly! I hope you get to make these soon!! My boys are totally into helping me in the kitchen right now – this is the ideal recipe to get them involved with the scooping and measuring! Amen! This is the perfect recipe to get your kids involved in the kitchen! Plus, you can feel good about feeding them this tasty snack. I love beautiful snack mixes like this one. It is perfect for the holidays! This looks fantastic! All of my boys would go nuts over this snack mix. I’m loving the combination. Snack mixes are the best! I know the kids will love this one! We keep ziplocs of Honey Nut Cheerios in my car for when we are out and about!!! LOVE this snack mix idea! 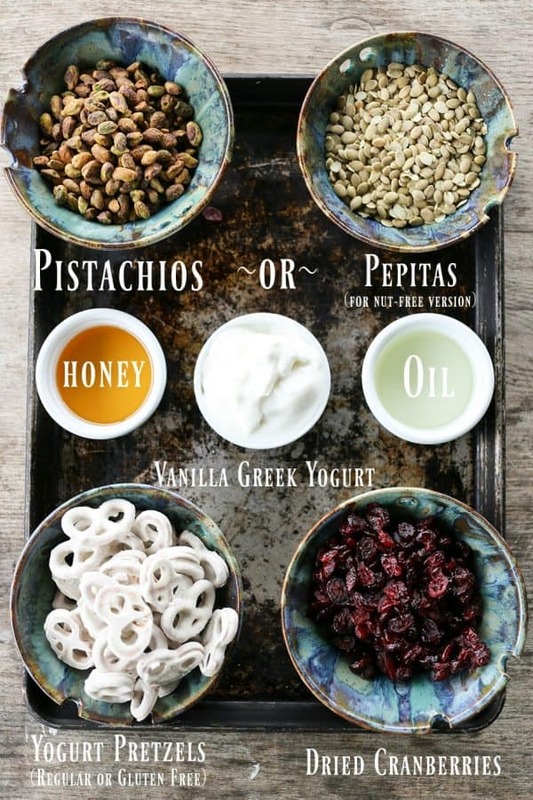 Love that you used Greek yogurt in the coating for this yummy snack mix! I love cranberries and pistachios together this time of year! This snack mix looks incredible! I could down this….and I totally want to! Such a fun recipe to make with the kids. Also really easy. Thanks for the idea! What a great idea! I’d love to try this one. Yum!! Bet this would be really good with the new Maple cheerios! This was a total mess for me. Soupy is a good way to describe it. Any ideas why this would happen? I’m sorry, Rhea. Without being in your kitchen, I really have no idea what could have gone wrong. Did you bake it long enough? Was the measuring accurate?